A new NASA-funded university study based on satellite data has found that Earth’s clouds got a little lower by around 1% cent a year on average during the first decade of this century. The results have potential implications for future global climate. 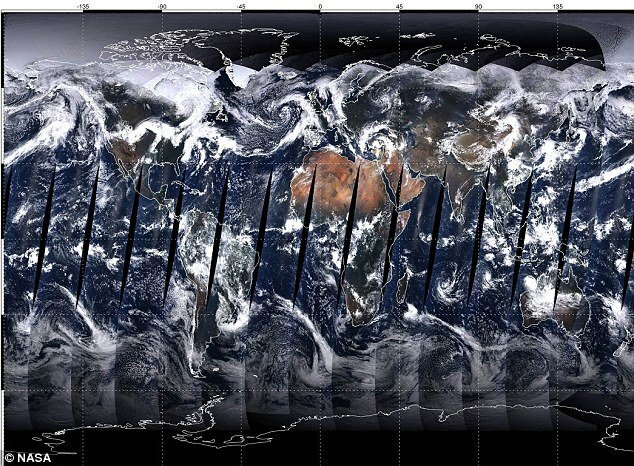 Scientists at the University of Auckland in New Zealand analyzed the first 10 years of global cloud-top height measurements (from March 2000 to February 2010) from the Multi-angle Imaging SpectroRadiometer (MISR) instrument on NASA’s Terra spacecraft. The study, published recently in the journal Geophysical Research Letters, revealed an overall trend of decreasing cloud height. Global average cloud height declined by around 1% over the decade, or by around 100 to 130 feet. Most of the reduction was due to fewer clouds occurring at very high altitudes. A consistent reduction in cloud height would allow Earth to cool more efficiently, reducing the surface temperature of the planet and potentially slowing the effects of global warming. This may represent a “negative feedback” mechanism – a change caused by global warming that works to counteract it. “We don’t know exactly what causes the cloud heights to lower,” says Roger Davies. NASA’s Terra spacecraft is scheduled to continue gathering data through the remainder of this decade. Scientists will continue to monitor the MISR data closely to see if this trend continues.